Allison Anne, I'll never forget the night I found out I was pregnant with you! Your dad was being economical and instead of buying one of the "stick" tests he bought this whole chemistry set with all these bottles and things to mix and it took forever, but when we finally saw the results we were so excited! I'll always remember your birth and when your dad handed you to me with all the "stuff" still on you and he said, "She kind of stinks." And I held you and you wouldn't stop crying and I had my first moment of panic because I didn't know what to do. But I just held you and talked to you and I think you knew my voice because you looked at me with those great, big, blue eyes and we had that moment together. The one where we said, "I know you. It's nice to see you." I'll never forget dressing you in all your pretty clothes and singing to you and feeling my heart break because I knew there was no way to stop time and hold on to those moments as long as I wanted and needed. I'll always remember your firsts. And I'll never forget hearing your little feet running down the hallway in the morning to jump into bed with us and get your "rassles" with daddy. I'll always remember when your sister was born and the way that, even as a two year old, you handled it with grace and patience. You loved her so much and never resented the attention she got or the time we had to spend in the hospital with her. I'll never forget the way you loved her and played with her and defended her. I'll always remember the day I realized you weren't a little girl anymore and the way I felt. So proud and scared. I'll never forget all the ways your tender heart reached out to me, to your sisters, to everyone you met. And I'll always remember how you met each challenge in your life with faith and hope and grace. You never let all of this transition get in the way of your growth. No, I'll never forget the love and pride I feel when I look at you and see this woman of God who is setting out to change the world and follow her own calling. I will forever treasure all of these things in my heart. Emmalynne Susan, I will always remember the night you were born. Such a wonderful but horrible night. I will never forget hearing that tiny cry, so different from your sister's loud screams, and I knew in my heart that our world had forever changed. I'll always remember that day when we got that awful diagnosis and my heart broke into a million pieces. I'll always remember the nights I spent in your daddy's arms crying til I didn't think I had anything left. And then crying some more. Letting go of so many dreams. But I'll always remember the way I fell in love with you. Once we got past all the scary stuff I found this precious little bundle of life that needed me more than I have ever been needed, so I mustered all the courage I could and learned to love unconditionally and without limits. I'll never forget how hard we worked for each little achievement and all the scary, awful moments in between. I'll always remember your first laugh. You were almost one and we were visiting friends. Allie and the girls were dancing to Barney and laughing and you were watching and I heard this little noise and I shouted, "I think Emma is laughing" and the girls spent the rest of the night making you laugh louder and louder and it was such a joyous moment for me. A simple thing, a laugh, but it meant the world. Oh, Emma, I'll never forget the last time I saw you alive. You were so sick but I had to leave to go get your sister so I leaned over the hospital bed and pushed your hair back and kissed your cheek and said, "Mommy will be back soon. I love you." And you looked at me and I left. I'll always remember that phone call from your daddy to come back to the hospital and the drive back and the long walk down the hospital corridor, silent and empty. I'll never forget seeing your lifeless body lying on the bed and knowing there was nothing I could do to stop time and go back. No way to get you back. I'll always remember that painful moment. But I'll never forget holding you in my arms, kissing your cheek, brushing your hair and feeling the peace in that room. It was such a moment of knowing without a single doubt that you were no longer in that body. All of the things that made you Emma had left this earth and I felt peace. At least for that moment. I'll always remember the feeling of you in my arms and the great joy and love you brought into my life. 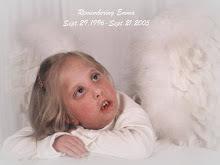 Emma, I'll never forget you. Anna Grace, I will always remember the day we got our referral. The day we had been waiting for for so long! And there was a glitch with the email and we just kept refreshing it over and over. For hours... and then finally this beautiful picture of your sweet face appeared and we fell in love with you. I'll never forget going to the orphanage and having you placed in my arms for the first time. What a moment to remember! I'll never forget our time in Vietnam getting to know you and coming home and so many people who loved you. I'll always remember the days spent building our relationship, the songs, the tears, the smiles, the snuggles. It was a process but so beautiful. I'll never forget your firsts, just like Allie and Emma. The day Allie coaxed your first smile was priceless! I'll always remember the energy and life you brought into our family. I will never forget each precious stage with you. You keep me on my toes and never let me get too comfortable in one. I'll never forget these "princess" moments. You steal our hearts with your tenderness and your humor. I'll always remember the feeling of love when you say, "You my best mommy ever!". I know you don't understand the meaning behind those words yet but they make my heart skip a beat. I'll never forget all these lessons you are teaching me about choosing to love and accept and what it means to be a child of God. Anna, I know we have so many moments left and I will cherish them all. I promise. I don't remember where I saw this but I read recently that every child is a divine appointment. Wow! I know that is so true with each of my girls. I can look at their lives and know that God placed us together for reasons only He truly understands. But I get glimpses of the big picture and I am amazed at the process. How He is using me to shape and mold them and how they have and are changing me to be more like Him. I look forward to the day I will see it all clearly but, until then, I am learning to enjoy the moments. And to never forget. Stacey, thank you so much for sharing your life with us. God has given you such a wonderful gift of expressing your feelings with beautiful words. It is truly awesome to read the things we feel as moms put so eloquently! Thank you again..and again! Pam F.
Oh Stacey, you wrote this beautifully. So special each one of your girls are to you and I feel the same about my 3 boys. They each bring something different and wonderful to family.